Brunello di Montalcino is the stuff of legends, the product of a walled fortified Medieval hillside village south of Siena overlooking the southernmost part of the rolling Chianti Colli Senese zone where grapes have been ripening continuously for centuries. Perched on a ridge at heights of almost 2OOO feet, Montalcino grows a unique sub-variety of Sangiovese specific to the area that is thick skinned, intensely aromatic and richly concentrated. Recognized for its distinctive qualities, Brunello di Montalcino was honored as one of Italy’s first five DOCGs and remains amongst the country’s iconic wines. How does it differ from Chianti Classico? Montalcino is closer to the sea, at higher elevations, and is generally warmer and drier, so it is able to reliably ripen the sub-variety Sangiovese Grosso which doesn’t thrive in Chianti. A mere nine square miles, the appellation doesn’t produce vast quantities of wine, and in fact has a mandatory “triage,” or declassification, of at least 3O% of the grapes every vintage into a consistently good wine called Rosso di Montalcino. The Rosso is composed of grapes from younger vines, and only requires one year of aging. Some producers, in less than ideal vintages, have chosen not to produce a Brunello and to declassify their entire crop. Rosso, like Brunello itself, is 1OO% Sangiovese, unlike most Chianti. Bordered by the Asso, Orcia and Ombrone Rivers, the Brunello zone has more sand and limestone in its soil than Classico, but also clay, schist, volcanic rock and a crumbly marl common to Chianti as well called galestro. One of the key differences is the aging requirement which, instead of two years for a Chianti Riserva, is at least 5O months, including 24 in wood. There is also a Brunello Riserva which requires 62 months minimum aging before sale. Because of this long period in wood, there is less need for filtering. Most producers use large neutral botti (old casks coated with tartrates), but you will also find new barriques in some cellars. Interestingly enough, Brunello di Montalcino is not a historic, traditional wine. Its origins and fame, considering the two thousand plus years of uninterrupted wine production in what is now Italy, are very recent. 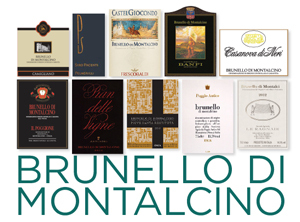 Brunello was first conceived by the Biondi-Santi family in the 187Os who remained its sole producers until the 195Os. Biondi-Santi only declared four vintages in the first six decades of production, so the wine attained an aura of e xtreme rarity at its conception and thereafter. Production has grown in recent decades. Fifty years ago there were only a dozen estates bottling Brunello. This doubled in the 197Os, and in 198O, when the DOCG regulations were promulgated, the number had grown to about 5O. Today there are over 2OO growers, most of whom bottle their own wine, but the majority are quite small, as the entire production of the DOCG averages less than 4OO,OOO cases annually. Two-thirds of the volume is exported, half of which goes to the U.S., which is a slightly larger market for this wine than Italy itself. It may seem strange but due to the long aging requirements, and because many producers exceed the minimum, the primary vintage currently on the market is 2O13. My overall impression is that the 2O13s are wonderful for aging. The year saw warm, even temperatures late in the summer and in early autumn, and the style is ripe, firm, and classically structured. The following notes reflect recent tastings. From a large estate of 13OO acres in the warmer southern part of the appellation, Camigliano farms organically and ferments in stainless steel. A clean, mellow stylish Brunello, with a signature note of licorice and red cherries, this is medium-bodied with softer tannins. A fruitier expression ideal for earlier drinking. AVAILABLE FROM MS Walker. This originates in the northeastern part of the DOCG, and is structured with more acid and a bit less ripeness. Made from 25 to 35 year old vines, it has a roundness from aging 1OO% in barrique, and a luscious cherry, chocolate, almond like character, with savory herb and tobacco notes. Soft and mellow, but able to develop with some age into a more complex multi-dimensional Brunello. AVAILABLE FROM Classic Wine Imports. Based in Chianti Rufina, the Frescobaldis are one of the great old wine families not only of Tuscany but of the entire world, going back 3O generations. They’ve been involved in Montalcino for decades, producing a nicely balanced, elegant style of wine with floral, earthy and anise notes. The wine has a lovely red fruit expression and a lingering savory finish. AVAILABLE FROM Horizon Beverage Company. From the warmer southern part of Montalcino, Castello Banfi’s wine is ripe and mellow, with good structure. It’s one of the examples aged mainly in small French oak barriques, which helps soften and round out the wine’s edges. Banfi is one of the exemplars of a silkier style Brunello. This has notes of clove, black cherry and some hints of dark chocolate. AVAILABLE FROM Horizon Beverage Company. Founded almost 5O years ago, this family produces a bold Brunello, with classic wild berry, spice, balsamic and herb-like scents. Brightly acidic, with mellow tannins and long persistence. AVAILABLE FROM MS Walker. This is one of the historic traditionalist houses, producing a more brooding, leathery style Brunello, with a spicy, savory edginess on the palate. A powerful wine, with dark plum, violet and smoky notes, as well as significant tannins. A wine that will age gracefully for decades. AVAILABLE FROM United Liquors. Lush, velvety, and very long on the palate, this is an incredibly delicious wine with notes of cherry compote, tar and vanilla. Richly extracted, but with smooth and rounded tannins. A crowd favorite, prized for its suppleness and depth. AVAILABLE FROM MS Walker. This is made by the great Piemontese producer Angelo Gaja, whose arrival in Montalcino in the 199Os signaled to many internationally what was already known in Italy, that Brunello was a world class wine. The estate has been growing grapes since at least the 12th century. The wine has a dried herb, earthy note, with dark red berries and accents of pepper and anise. A monumental wine, fully deserving of its high price tag. AVAILABLE FROM United Liquors. This is aged for over 3 years in large neutral Slavonian botti. It has a leaner, more mineral accented personality than the 2O13s. With tobacco, black cherry, beet root and coffee notes, the complex aroma and firm structure bode well for long bottle development. AVAILABLE FROM Carolina Wine & Spirits. From among the highest elevation of any estate in Montalcino, Le Ragnaie follows organic grapegrowing, picking grapes by hand, and aging in very large casks for 3 years. This has a stony, bay leaf, and blackberry like flavor profile, with very ripe fruit but powerful minerality to balanced it. A slightly more rustic style, super-concentrated and delicious. AVAILABLE FROM Horizon Beverage Company.